A Junior Ranger talks with a conquistador re-enactor during a living history program. 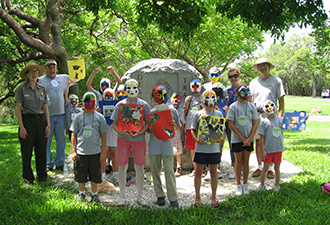 Junior Rangers display the Indian masks they created during summer camp. Many visit De Soto by water and enter through the park’s cove entrance. On a swelteringly hot day in May 1539, Spaniard Hernando de Soto splashed ashore at Tampa Bay intent on capturing the riches of La Florida by any means necessary. His army was alternately welcomed and opposed by Native American tribes throughout what is now the southeastern United States in a four year, 4,000-mile odyssey of intrigue, warfare, disease, and discovery. No single event in early American history has shaped the face of this nation more than the expedition of Hernando de Soto. De Soto’s expedition began a clash between the Old World beliefs of Europe and the New World people of the Americas. De Soto’s expedition was the first to explore and chart most of what is now the southeastern United States known at that time as La Florida. The stories from expedition chroniclers give us the best glimpse of Native American life as it was in the 16th century. De Soto National Memorial is located along the banks of the historic Manatee River where it meets with Tampa Bay and the Gulf of Mexico. Here you can take in the scenic view, much as it was when Native Americans lived along its shores and Spanish conquistadores blazed paths through Florida’s unique environment. Join rangers for guided trail hikes and explore Florida’s Mangrove jungles and coastal forests. 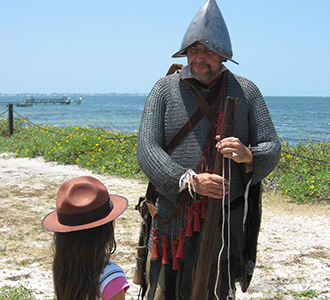 From mid-December through the end of April, De Soto National Memorial offers living history programs, where rangers and volunteers dress in period clothing and offer visitors a chance to experience life in a 16th century Spanish encampment. Here visitors can hear tales of De Soto’s expedition and the Native American societies that made up the southeastern United States. At the end of every talk visitors will have the opportunity to witness the sights and sounds of combat as rangers recount the conflicts that happened between the Spanish and the Indians and witness the power of the matchlock arquebus, an early firearm. 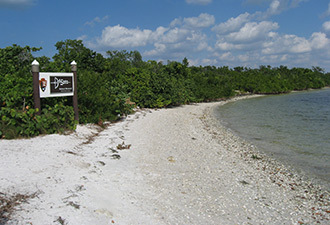 De Soto National Memorial offers a broad range of year round activities. In the summer Junior Rangers are invited to participate in our summer camp where they learn how Native Americans lived in the environment and how tough it was on the Spanish conquistadores. Enjoy Florida’s mild fall and winter temperatures with a variety of concerts, films, and outdoor holiday events. Coming soon, rangers will lead park visitors around the native waterways in guided kayak tours. Come and follow in the footsteps of early European explorers and American Indian people. Learn about America’s tumultuous past and what price was paid to gain gold and glory in the land that would be known as the United States. De Soto National Memorial offers you a unique opportunity to experience your America and its history firsthand. To learn more about the De Soto expedition and what to do and see while visiting the park visit our website.